At the same time deaths from unsafe abortion rose rapidly. Between 1966 and 1989, while abortion was illegal in Romania, overall maternal mortality increased dramatically, from 85 per 100 000 live births in 1965 to a peak of 169 per 100 000 live births in 1989.1 Over the same period, maternal mortality from unsafe abortion skyrocketed to an incredible 147 per 100 000 live births, while maternal deaths from other obstetric causes continued to decline. 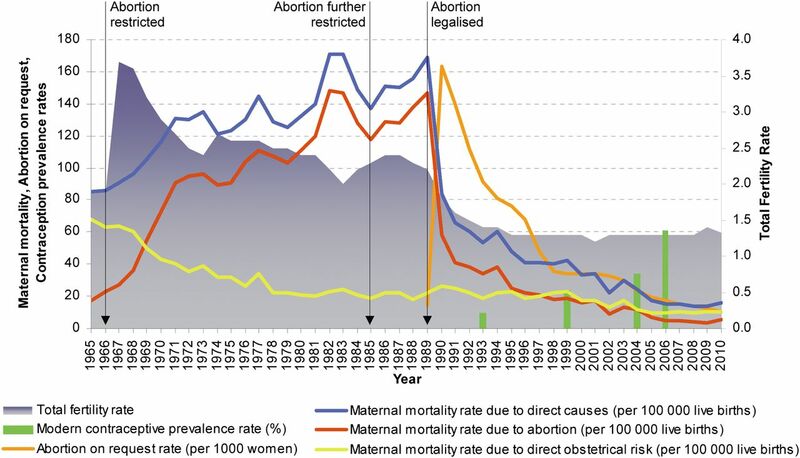 Figure 1 illustrates the peak and plateau in total fertility, along with the striking rise in maternal mortality that was solely driven by abortion-related deaths, as maternal deaths from other obstetric causes continued to fall. Abortion, contraception, maternal mortality and fertility in Romania during the period 1965–2010. After a drop from 2.2 in 1989 to 1.8 in 1990 and to 1.4 in 1993–1994, the TFR in Romania has remained constant at 1.3,2 despite the marked rise in contraceptive prevalence. This rise in contraceptive use has been accompanied by a decisive fall in the induced abortion rate from 163.6 per 1000 women in 1990 to 10.1 in 2010 and in the abortion-related maternal mortality rate from 147 per 100 000 live births in 1989 to 5.2 in 2010.5 Figure 1 shows a combined view of abortion, contraception, maternal mortality and TFRs for the 20 years following the change in abortion legislation. As has been suggested elsewhere,10 there may be a number of plausible explanations for such a dramatic drop in the abortion rate, including increased contraceptive effectiveness, and shifting attitudes about the acceptability of abortion which could decrease women's willingness to report abortions. Indeed, many factors may have contributed to decreases in induced abortions. However, although we cannot directly attribute causality, we have no data to suggest that there was a decline in the completeness of reporting abortion experiences in successive surveys. The marked rise in contraceptive prevalence coinciding with a dramatic decline in the abortion rate makes increased modern contraceptive use the most likely explanation for the steeply falling abortion rate in Romania. Few countries in history have made such dramatic shifts in family planning policy or availability that would allow the study of causal links between access to contraception and abortion and changes in reproductive outcomes. While the fertility patterns illustrated by the Romanian example highlight the complex nature of fertility and its determinants, two points emerge clearly. First, restricting access to safe abortion in Romania caused a dramatic increase in maternal mortality driven solely by unsafe abortion-related deaths. And second, increased access to modern contraception in Romania over the last 15 years has not reduced fertility in the country, but instead has reduced the need for women to resort to abortion. Countries that increasingly seek to restrict access to abortion and contraception should look and learn from Romania's example. The authors wish to thank Dr Martha Campbell for her guidance and invaluable perspective.
. Fertility effects of the abolition of legal abortion in Romania. Popul Stud 1972;26:405–417. Romanian National Institute of Statistics. Statistical Yearbook 2010. 2012. http://www.insse.ro/cms/rw/pages/anuarstatistic2010.en.do [accessed 2 September 2012].
. Contraception and abortion in Romania. Lancet 1993;341:875–878.
. The impact of recent policy changes on fertility, abortion, and contraceptive use in Romania. Stud Fam Plann 1995;26:76–87. Romanian Ministry of Health, National Institute for Public Health, National Center for Statistics and Informatics in Public Health. Yearly bulletins on main health indicators and on maternal mortality. http://www.ccss.ro/public_html/?q=content/date-statistice-0 [accessed 2 September 2012]. Romanian Ministry of Health, Institute for Mother and Child Care, Division of Reproductive Health, Centers for Diseases Control and Prevention. Romania: Reproductive Health Survey, 1993. Final Report. 1995. Romanian Association of Public Health and Health Management, School of Public Health, University of Medicine and Pharmacy “Carol Davila”, National Commission for Statistics, Division of Reproductive Health, Centers for Diseases Control and Prevention, USAID, UNFPA, UNICEF. Romania: Reproductive Health Survey, 1999. Final Report. 2001. Romanian Ministry of Health, World Bank, UNFPA, USAID, UNICEF. Romania: Reproductive Health Survey, 2004. Summary Report. 2005. UNFPA, Max Plank Institute for Demographic Research, National Institute of Statistics. Romania Gender and Generations Survey. First Wave Report. 2007.
. Induced abortion: incidence and trends worldwide from 1995 to 2008. Lancet 2012;379:625–632.